Description: Westbound D&H train number 265 at JU Interlocking. Description: CP 261 rolls west through the Canisteo valley past some of the local farm products. A smattering of fall color still clings to a few trees weeks after most of the leaves have fallen. Description: One of the more scenic spots on the Tier is the big curve at Chemung. Trains look great rolling through. The old Erie station is partly visible next to the radio pole. Description: The last of the fall color highlights the red leader as 261 rolls under the NY 282 overpass at Smithboro. Description: CP train 261 waits for 270 to come east so it can resume the trip to Buffalo. At this late date, theres still some fall color. Description: 167 with 6 units rolls past the locatin where the former LV Auburn Branch crossed under the Erie under a blanket of snow. Description: Candy Apple Red SOO 6051 on CP X501. Description: BNSF SD-40-2 7860, NS Dash 9 9734, and ex Santa Fe SD-40-2 greet a Soo Line unit with SD-60 6051 on the head end. Description: Thats SOO 6062 behind the 6051. Description: Close up of the front end of the 6051 Note the GE sticker on the short hood. Description: Idling on former CNJ trackage in Bethlehem Pa. 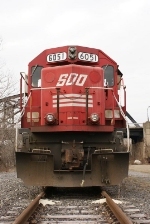 Description: Profile shot of SOO LINE 6051 at Bethlehem PA.